Forget Mother’s Day. What’s Father’s Day? And Valentine’s Day? Pah…so last year…. 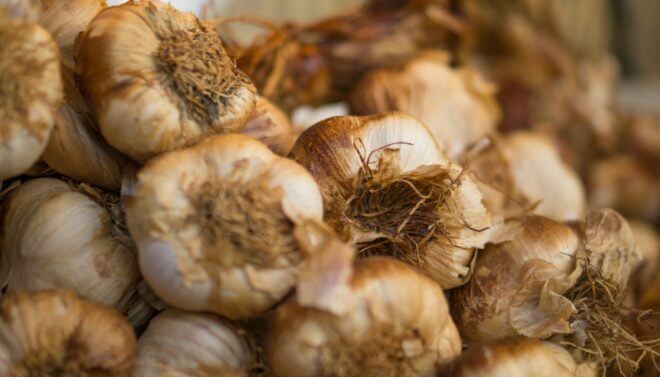 April 19th is the day we’ve all been waiting for with baited breath – it’s World Garlic Day! Facing the jealous wrath of its cousins the onion, shallot, leek and chive, who can only dream of having a whole day named after them, the garlic is finally right where it belongs – centre stage! Distinguished by its pungent aroma and deep flavour, garlic is one of our favourite ingredients at Quattro Foods and our ambient range celebrates all things garlicky. As one of the UK’s leading food manufacturers we are on the garlicky front-line. Many of our clients request garlic-specific food products that they then use to create menus and dishes for their clients in turn. From high street chains to private restaurants, from the NHS to the army and schools as well as food service providers across the UK, it’s fair to say that a Quattro garlic enjoys a varied journey, adventuring from a field or farm to its eventual destination – the palette of the discerning foodie. Not only do our innovative chefs create garlic centric products for clients who specifically request them, but they also add the eponymous vegetable (technically it is – if you have any scientific arguments, please leave comments at the bottom of this blog!) to add some punch to a range of other flavoursome produce. Apart from the mouth-watering taste, garlic is truly a superfood. Its health benefits are widely known and many people take garlic as a daily vitamin as it’s highly nutritious and has few calories. For thousands of years, garlic was believed to have medicinal properties and apparently there’s now a smattering of science to confirm it. It’s been proven as an excellent source of vitamin B6 and is a good source of magnesium, selenium and vitamin C as well as calcium, potassium and iron. It’s even been said to combat sickness, including the common cold and apparently eating enough of the stuff can reduce blood pressure and cholesterol levels. Many believe that natural supplements almost have the power of licensed drugs, and with such a delicious taste and aroma it’s possibly worth trying, alongside any prescribed medication, not in place of it, naturally. Life hack: If you love garlic but you hate the smell, here’s a tip – try chewing parsley, it works really well as a breath freshener. Happy World Garlic Day one and all!